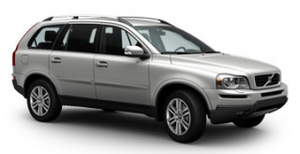 The Volvo XC90 is as easy, responsive and rewarding to drive as a regular Volvo saloon or estate model. Its torsionally rigid body, transverse engines and All Wheel Drive combine to create almost even weight distribution (53 per cent front, 47 per cent rear). The front MacPherson suspension, together with the ZF steering gear, promotes increased precision and sharp response. The Volvo XC90's braking system is designed and tested to help stop the vehicle safely, even when it is fully loaded with seven people and luggage, and is backed by sophisticated traction and stability control systems. Dynamic Stability and Traction Control (DSTC) is standard on every model and prevents wheelspin by either braking the wheel that has lost traction (up to 25mph) or, at speeds above 25mph, by reducing engine power and using extra sensors to detect the onset of a skid. The system then automatically slows the appropriate wheel to restore control. It ensures that the driven wheels get exactly as much power as they can transfer to the road. All Volvo XC90s benefit from ABS brakes with EBD (Electronic Brake Distribution) and EBA (Emergency Brake Assist) which monitors how quickly the brake pedal is pressed, and determines if the driver is panic-braking. When this occurs, the brake pressure is boosted to maximum in the shortest possible time, to reduce the stopping distance. Volvo's Geartronic transmission - standard on 3.2-litre petrol models, optional on the D5 - gives the driver the best of both worlds. Geartronic automatically adjusts its shift points to reflect the driver's style and also offers a manual, sequential-shift facility where the driver is able to choose gears individually by tipping the lever forwards to change up and backwards to change down. It also features a 'W' setting for winter driving on slippery surfaces when it will start in a higher gear to avoid wheelspin and loss of control.